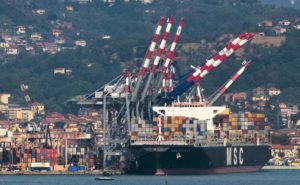 Contship Italia Group, Italy’s leading maritime container terminal and intermodal operator, reports a 1.3% decline in volumes handled at its terminals in 2017 (6.303 mln TEU) as compared to 2016 (6.386 mln TEU), although its rail freight traffic was up 11% (301,009 TEU). The company highlights that while its gateway terminals with access to Italy, southern and central Europe in La Spezia, Salerno and Ravenna continue to grow (+13.2%, +232,000 TEU), the transhipment facilities in Tangier, Cagliari and Gioia Tauro registered a 6.8% decrease (-315,000 TEU) year-on-year, mostly due to a 12.4% drop in the Group’s flagship Medcenter Container Terminal at the hub of Gioia Tauro in southern Italy. Hannibal, the company’s intermodal service provider for maritime and continental transport, reported a 11% growth in transported TEU (+30,000 TEU) demonstrating an increase in volumes for the second consecutive year. This was achieved despite a major disruption at Rastatt between Basel and Karlsruhe in August 2017, where the two-month closure of the crucial part of the Rhine Alpine railway corridor resulted in a standstill of rail freight between Western Europe and Italy and led to 181 less trains handled by Contship Rail Hub in Melzo (Milan) in 2017 overall. “Contship continues to work hard to provide the market with fully integrated and competitive port-to-door services by deploying innovative solutions and strong inland connections with expected further growth in Italy and over the Alps,” added Cecilia Eckelmann-Battistello.